> Threads & Trends > Blog > Blogging about 3 types of Printing. In this blog we will share information on the different types of printing so you can make an educated choice on your next printing job. No worries if you can’t decide, we are here to help and guide you to the best choice. DTG is pretty much like using a printer to print on fabric. Because it works like a printer, it can support the most detailed design, with as many colors as you want. The printer can only print one garment at a time, which makes it perfect for printing one-of-a-kind t-shirts. This is the process of pulling a layer of ink over a screen to produce a design. A special screen has to be made for each design, which means that there should be many orders of the same design for it to be worth it. This is the process of printing onto a special sheet of paper, and then transferring that image onto fabric. The ink is heated until it disintegrates into the corresponding fabric. That makes the ink long-lasting, and you’ll never have the unfortunate “peeling” effect of a well-worn t-shirt. This is most popular for sports organizations. The first question is about the quantity that you’re selling. 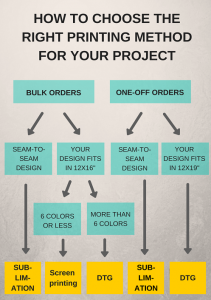 If you’re planning on doing everything one-off and drop-shipped, and you can’t really plan the amount of sales you’re making, then chances are you’re better off using DTG (direct-to-garment). If you’re ordering many in one go (think team sports, camps, clubs, etc. ), and you know you’ll be making at least 15 of the same design, then you might begin to consider screen printing. Your design is the most important element in deciding which printing method is for you. If your design involves many different colors, intricate details or photography images, then DTG will be your best shot. You should already have an idea of what your design will be. Will it be photography? How many colors are in one design? Maybe it’s black and white, or simply lettering? Do you intend to have your design stretch from one seam to the other?